Reader Markus asked about my keyword hierarchy ... so here it is. First off, credit where credit is due. When I build up my keywords, I scoured the web looking for some examples. I found a great post by William Beem on keywords, and used his hierarchy as a starting point for mine. At the top level, quite succinct. Every one of my images will have keywords from Description, Place, and Subject. For the rest, depends on the image. If you've opened the link above, you'll find I have many specific Subjects, and a fair amount in Description. Places are pretty detailed as well. And these grow over time as I visit new places, shoot new subjects, and so forth. I did make an effort to seed certain areas initially. William's post helped with that a lot ... hopefully my list will too. "Image Type" is inside my "Description" bucket. Every one of my images gets a keyword from this set. Most of the time, an image is self explanatory and I know where I took the shot. Thus, I find typing the keyword in to the button bar is the quickest method to add a keyword (the fewer clicks the better), but "Image Type" is important to me so I use the on-screen visual reminder. 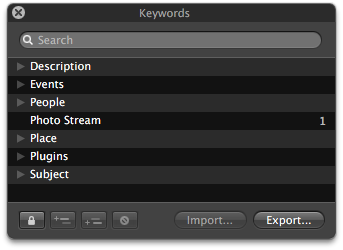 Keywording in Aperture is powerful. And for the diligent, the effort can really pay off.